Pour the stock into a pan and add the saffron. Heat gently until the liquid is steaming, but not boiling. Heat the oil in a large pan and gently cook the onion, chillies and rosemary for a few minutes until softened and golden. Add the haddock and prawns then pour over the saffron stock, cover and simmer for 5 minutes until the fish and prawns are cooked through, the prawns are pink and the haddock opaque. 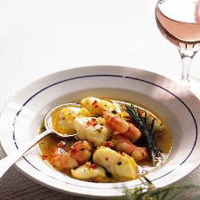 Ladle into shallow bowls, garnish with a sprig of rosemary and serve immediately.